I was born in Feb 1951 in London and have collected teddies and other soft furries for almost as long. I have always enjoyed art, making things and needlework so I guess that it isn't that surprising that I have designed and created things in my spare time. I have collected bears for as long as I can remember but I didn't start making them until late 1996 after visiting the Hugglets show in Kensington and desperately wanting a bear I couldn't afford. Once I had made one, I was hooked! At the time I was teaching computer science to university level students so it was very much something I could only do in my limited spare time and progress was quite slow. I was designing my own right from the start though initially they were very traditional. 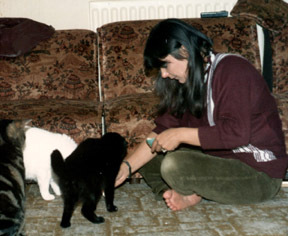 But my love of cats led me to experiment and by 99 I had made my first feline which I took to a show to ask a bear artist for an opinion and ended up with Teddy Bear Club International asking for a picture, that led to me being persuaded to enter a competition and at the end of the year I received my first award but I didn't know anything about the bear business so while it gave me many nice swaps it was another couple of years before I gained enough confidence, experience and courage to try to make something more of this wonderful pastime. Today Woodland Teddies fills my life, I design and create everything you see here and for a number of years I was also the Creative Editor for Teddy Bear Scene where I wrote features and offered patterns, advice and assistance to readers. I also still keep my hand in with computers by designing and maintaining one or two web sites. I adore all things soft and cuddly particularly one of life's most beautiful of all furry creations - the cat, so I naturally share my home with two fabulous felines and a house full of furry creations both mine and those of others artists which includes bears, cats, dogs, rabbits, birds, frogs, dragons and the occasional monster some of which I have made using polymer or air drying clay. I collect all types of furry creatures and have over 400 with new ones joining all the time so I am still not opposed to creating a Woodland Teddy as a swap or to offer in part exchange, as long as you don't mind the wait so if you make bears you think I might like why not email me or give me a call on 01509 267597 and who knows we could arrange something that we can both enjoy.